Nearly 50,000 Pakistani immigrants became citizens of the rich industrialized countries of the Organization of Economic Cooperation and Development (OECD) in 2015, according to International Migration Outlook 2017 recently published by the Organization. 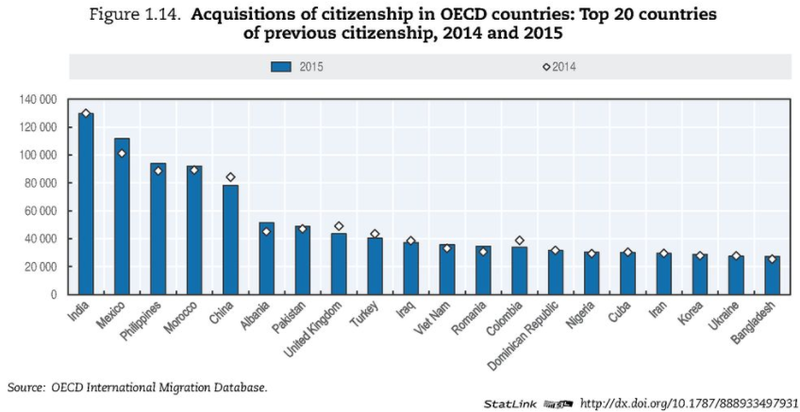 India topped the list with 130,000 Indians acquiring citizenship of OECD nations in 2015, followed by Mexico (112,000) ranked 2nd, the Philippines (94,000) ranked 3rd, Morocco (94,000) ranked 4th, China (78,000) ranked 5th, Albania (52,000) ranked 6th and Pakistan (50,000) ranked 7th. In addition, Pakistan was the 18th largest source of immigrants with 99,000 Pakistanis migrating to OECD nations in 2015. 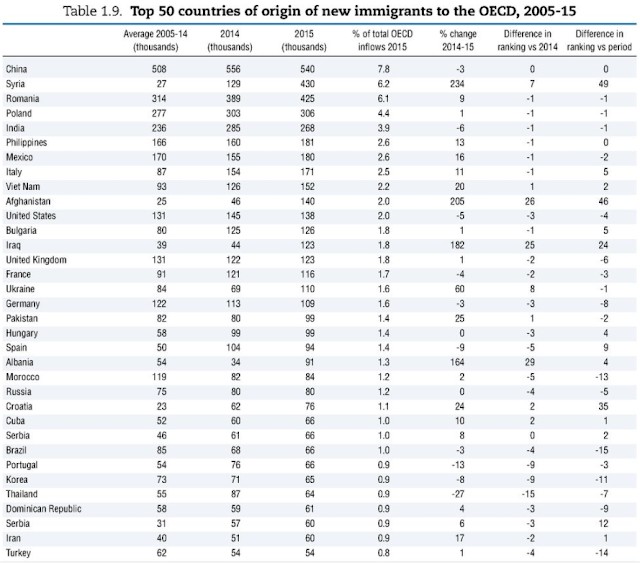 India is 5th on this list with 268,000 Indians migrating to OECD countries. Humanitarian migration of refugees, rather than migration for better economic prospects, dominated OECD inflows during 2015. War-torn Syria was the second largest source with 430,000 migrants in 2015, the report said. India is the world's largest exporter of labor with 15.8 million Indians working in other countries. Bangladesh ranks 5th with 7.2 million Bangladeshis working overseas while Pakistan ranks 6th with 5.9 million Pakistanis working overseas, according to Pew Research report released ahead of International Migrants Day observance on Sunday, December 18, 2016. Pew Research reports that nearly 3.5 million Indians lived in the UAE, the world’s second-largest migration corridor in 2015. 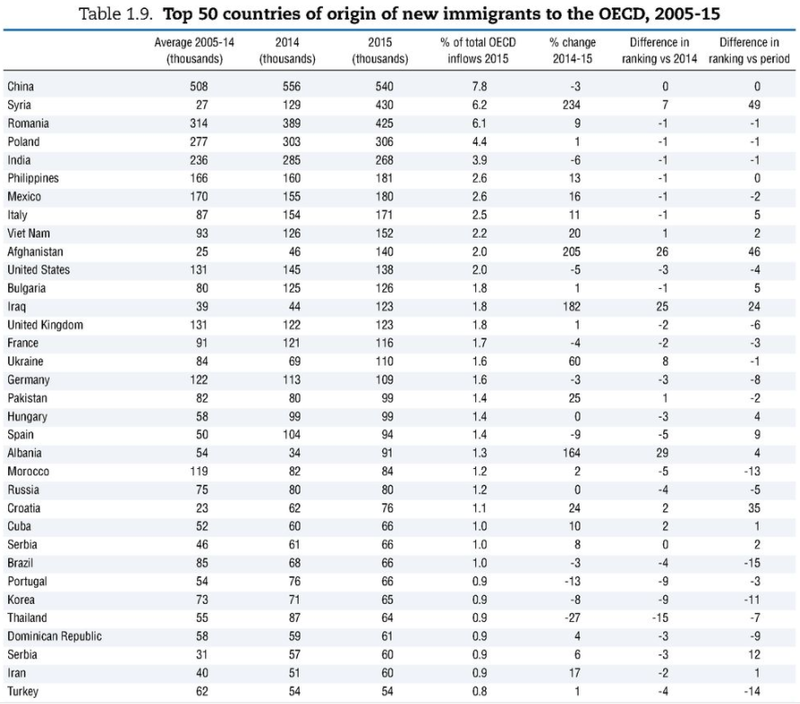 While most of the migration is from low and middle income countries to high-income countries, the top 20 list of migrants' origins also includes rich countries like the United States (ranked 20), United Kingdom (11), Germany (14), Italy (21) and South Korea (25). 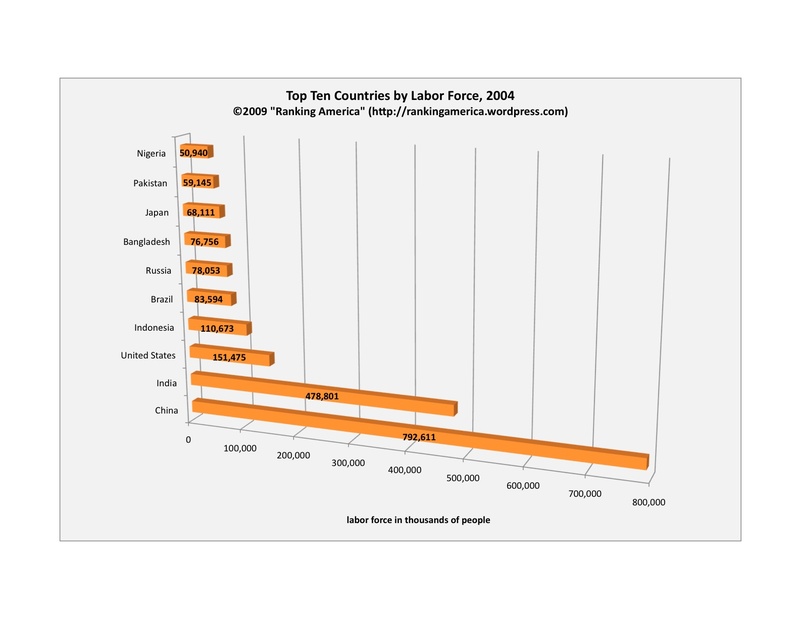 "In Asia and the Pacific, many economies could expand their role as the source or host economy for migrant workers. Labor supply is still growing in developing economies—such as Cambodia, Indonesia, the Lao People’s Democratic Republic, Mongolia, Myanmar, India, Pakistan, and the Philippines—and they could export labor across the region. In contrast, developed but aging economies such as Hong Kong, China; the Republic of Korea; Japan; and Singapore are unable to meet labor demand with their dwindling workforce. Hence, these economies would benefit from immigrant labor. Kang and Magoncia (2016) further discuss the potential for migration to reallocate labor from surplus to deficit economies and offer a glimpse of how the demographic shift will frame Asia’s future population structure, particularly the future working age population. Among the issues explored is the magnitude of labor force surpluses and deficits within different economies in Asia." Pakistan has the world’s sixth largest population, sixth largest diaspora and the ninth largest labor force with growing human capital. With rapidly declining fertility and aging populations in the industrialized world, Pakistan's growing talent pool is likely to play a much bigger role to satisfy global demand for workers in the 21st century and contribute to the well-being of Pakistan as well as other parts of the world. With half the population below 20 years and 60 per cent below 30 years, Pakistan is well-positioned to reap what is often described as "demographic dividend", with its workforce growing at a faster rate than total population. This trend is estimated to accelerate over several decades. Contrary to the oft-repeated talk of doom and gloom, average Pakistanis are now taking education more seriously than ever. Youth literacy is about 70% and growing, and young people are spending more time in schools and colleges to graduate at higher rates than their Indian counterparts in 15+ age group, according to a report on educational achievement by Harvard University researchers Robert Barro and Jong-Wha Lee. Vocational training is also getting increased focus since 2006 under National Vocational Training Commission (NAVTEC) with help from Germany, Japan, South Korea and the Netherlands. Pakistan's work force is over 60 million strong, according to the Federal Bureau of Statistics. With increasing female participation, the country's labor pool is rising at a rate of 3.5% a year, according to International Labor Organization. With rising urban middle class, there is substantial and growing demand in Pakistan from students, parents and employers for private quality higher education along with a willingness and capacity to pay relatively high tuition and fees, according to the findings of Austrade, an Australian government agency promoting trade. Private institutions are seeking affiliations with universities abroad to ensure they offer information and training that is of international standards. It is extremely important for Pakistan's public policy makers and the nation's private sector to fully appreciate the expected demographic dividend as a great opportunity. The best way for them to demonstrate it is to push a pro-youth agenda of education, skills development, health and fitness to take full advantage of this tremendous opportunity. Failure to do so would be a missed opportunity that could be extremely costly for Pakistan and the rest of the world. In the high fertility countries of Africa and Asia family sizes are continuing to decline. And in low fertility countries family sizes will continue to remain below replacement levels. Why? Because the same juggernaut forces are operating: increasing urbanization, smaller and costly housing, expanding higher education and career opportunities for women, high financial costs and time pressures for childrearing and changing attitudes and life styles. 115 countries, including China (1.55), Hong Kong (1.17), Taiwan (1.11) and Singapore (0.8) are well below the replacement level of 2.1 TFR. 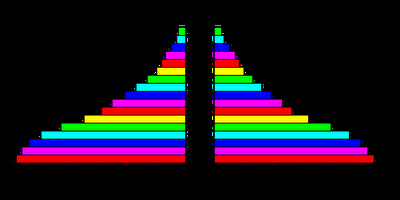 Their populations will sharply decline in later part of the 21st century. United States is currently at 2.01 TFR, slightly below the replacement rate. "We don't take a stance one way or the other on whether it's good or bad," said Mark Mather, demographer with the Population Reference Bureau. Small year-to-year changes like those experienced by the United States don't make much difference, he noted. But a sharp or sustained drop over a decade or more "will certainly have long-term consequences for society," he told Utah-based Desert News National. Japan (1.4 TFR) and Russia (1.6 TFR) are experiencing among the sharpest population declines in the world. One manifestation in Japan is the data on diaper sales: Unicharm Corp., a major diaper maker, has seen sales of adult diapers outpace infant diapers since 2013, according to New York Times. 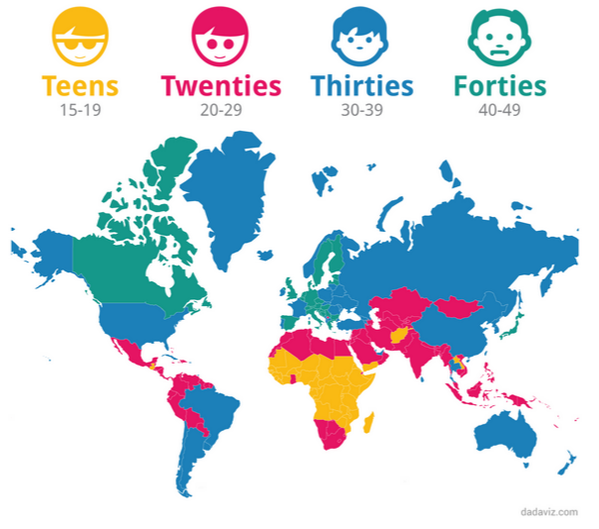 Median Age Map: Africa in teens, Pakistan in 20s, China, South America and US in 30s, Europe, Canada and Japan in 40s. The Russian population grew from about 100 million in 1950 to almost149 million by the early 1990s. Since then, the Russian population has declined, and official reports put it at around 144 million, according to Yale Global Online. Countries, most recently China, are finding that it is far more difficult to raise low fertility than it is reduce high fertility. The countries in the European Union are offering a variety of incentives, including birth starter kits to assist new parents in Finland, cheap childcare centers and liberal parental leave in France and a year of paid maternity leave in Germany, according to Desert News. But the fertility rates in these countries remain below replacement levels. Overzealous Pakistani birth control advocates need to understand what countries with sub-replacement fertility rates are now seeing: Low birth rates lead to diminished economic growth. "Fewer kids mean fewer tax-paying workers to support public pension programs. An "older society", noted the late Nobel laureate economist Gary Becker, is "less dynamic, creative and entrepreneurial." Growing labor force n Pakistan can not only contribute to Pakistan's prosperity but also help alleviate the effects of aging populations and declining labor pools in more developed economies. I believe that Pakistan's growing population and young demographics should be seen as a blessing, not a curse. Noticeable among the emigrants-aplenty countries you have listed are Japan, Canada, France, Germany, the USA, and yes, the KSA -- if only because people there are comfortable with where they are. Therefore, it seems, it is a terrible thing for a country to be on that list you cite. Anon: "On a per capita basis Pakistan beats India by a country mile.India has around 3X immigrants with 7X the population..."
Poorest and least developed people tend to stay put where they are; they do not migrate. It's only people who have a certain level of income and skills who are more likely to migrate to other countries for better opportunities. This fact has been well-established by multiple studies conducted in Africa. "Results show that despite increase in the absolute number of migrants, Africa, particularly SubSaharan Africa has one of the lowest rate of emigration in the world .... Poorer countries generally have lower rate of emigration ......Bad socio-economic conditions generally seem to lead to higher rate of emigration by highly skilled individuals. Generally, migration is driven by motives to improve livelihoods with notable evidence on changes in labor market status. Often, self-employed or unemployed émigré ended up in wage employment. The paper outlines policy issues emerging from the migration trend in Africa." Shams: " Noticeable among the emigrants-aplenty countries you have listed are Japan, Canada, France, Germany, the USA, and yes, the KSA -- if only because people there are comfortable with where they are." It seems you failed to notice that US (138,000), UK (123,000) , France (116,000) and Germany ( 109,000) all all listed above Pakistan (99.000) ....they each had more people migrating to other countries, even though all except US have significantly smaller populations. 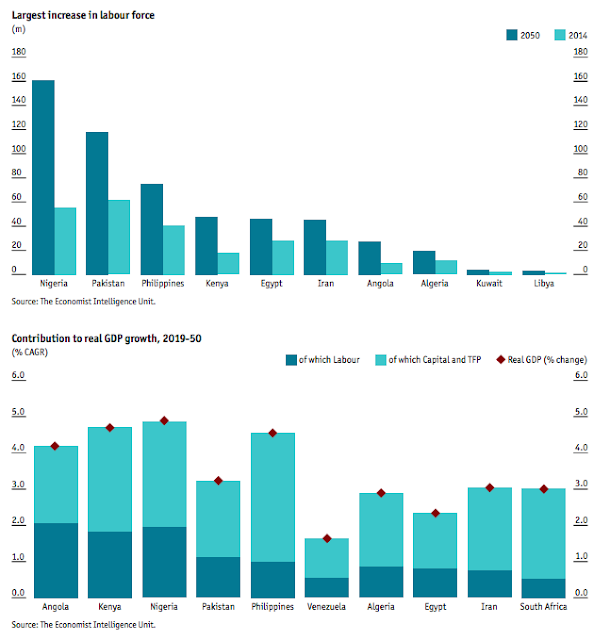 Growth Forecast 2014-2050 shows Pakistan GDP growing at barely above 3%! Nigeria, Philippines Angola are much faster and then you want population growing more. If that happens you have very small per capita growth. Am I missing something? "Poorest and least developed people tend to stay put where they are; they do not migrate. It's only people who have a certain level of income and skills who are more likely to migrate to other countries for better opportunities. " Except those who migrate out as asylum seekers, like minorities of Pakistan. "On a per capita basis Pakistan beats India by a country mile.India has around 3X immigrants with 7X the population..."
that is because pakistan se Zinda bhaag. In any case majority of them end up as taxi drivers and pizza delivery, not as Univ Prof or CEO of IT companies. So Riaz, if Indian leave India it is because India is hell. If Pakis leave their motherland, it is sign of their superiority?? RK: " In any case majority of them end up as taxi drivers and pizza delivery, not as Univ Prof or CEO of IT companies." That's just false. Some do drive taxis and there's nothing wrong with that. However, Pakistan is also the the 2nd largest source of foreign doctors in UK and the 3rd largest source of foreign doctors in US, according to OECD. And there are thousands of Pakistan techies in Silicon Valley working on leading edge as engineers, entrepreneurs and executives. RK: " So Riaz, if Indian leave India it is because India is hell. If Pakis leave their motherland, it is sign of their superiority??" They would all leave India if they could but a lot fewer Indians have the means and the skills needed than the Pakistanis because of India's low median income and high levels of poverty compared to Pakistan. Aftab: "Growth Forecast 2014-2050 shows Pakistan GDP growing at barely above 3%! " Pakistan’s predicted annual growth rate for the next 10 years is 5.07 percent, according to the Center for International Development at Harvard University (CID) research published recently. World Bank expects Pakistan growth to pick up to a 5.2 percent rate in fiscal 2017 (July 1, 2016 – June 30, 2017) and to 5.5 percent in the next fiscal year, reflecting an upturn in private investment, increased energy supply, and improved security. Every year, the world’s population is expanding by 83 million people. Right now, there are around 7.6 billion people in the world. By 2050, there will be just short of 10 billion. But population trends are wildly uneven - some countries are rapidly expanding, others are shrinking. Each scenario brings its own challenge for governments. Countries whose populations are declining have to think about how to support older people when there fewer young workers to pay into government funds. Countries with a booming young population have to grapple with how to feed them and provide education and healthcare. Three major things affect population. Fertility is the main factor, followed by mortality and then migration. Here are some key facts about the world’s population, taken from the latest UN World Population Prospects. China currently has 1.4 billion inhabitants, closely followed by India with 1.3 billion. Together they make up 37% of the world’s population. Nigeria is currently 7th on the list of most populous countries, but before 2050 it will have made third place, overtaking the US. Since the 1960s, the global birth rate has fallen to an average of 2.5 births per woman. However, that average is made up of highly diverse figures: in Africa its 4.7 births per woman, in Europe it’s 1.6 births per woman. 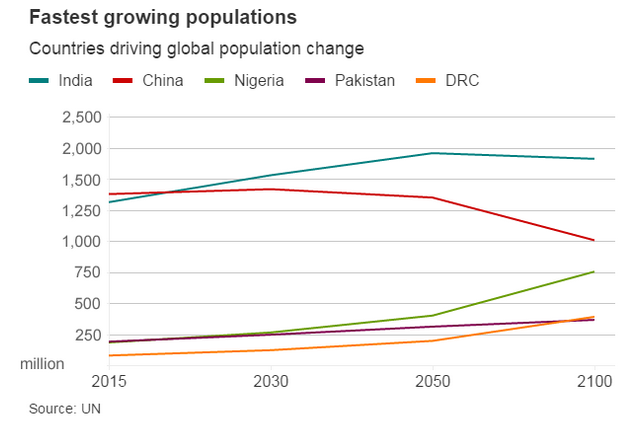 From 2017 to 2050, India, Nigeria, the Democratic Republic of the Congo, Pakistan, Ethiopia, the United Republic of Tanzania, the United States of America, Uganda and Indonesia will contribute the most to population growth. This means that the population of Africa is set to roughly double between now and 2050. Between 2010 and 2015, 46% of the world’s population lived in 83 countries where the fertility level was below the threshold of 2.1. An increasing number of people are living to a ripe old age. In 1950, there were far more young than old. In 2017, there are fewer young and more older people. By 2050, the numbers will even out. Overall, life expectancy is increasing. On a global level, life expectancy at birth rose by almost 4 years, or from 67 to 71 years, between 2000 and 2015. It is projected to rise to around 77 years in the period between 2045 and 2050, and eventually to 83 years in the period between 2095 and 2100. In 2017, 60% of the African population is under the age of 25, only 5% are 60 or older. In Europe, only a quarter of the population is under 25. Another quarter are 60 or older. Between 1950 and 2015, Europe, Northern America and Oceania, more people immigrated in than migrated out. Africa, Africa, Asia and Latin America and the Caribbean had more people leave than enter. Migration peaked in 2005-2010 to 4.5 million people per year moving between major regions of the world. Between 2010 and 2015 the figure was 3.2 million. For countries with low fertility rates, migration may be the only way to avert population decline.